Three good reasons to switch to the Physiogel Cleanser + a giveaway! 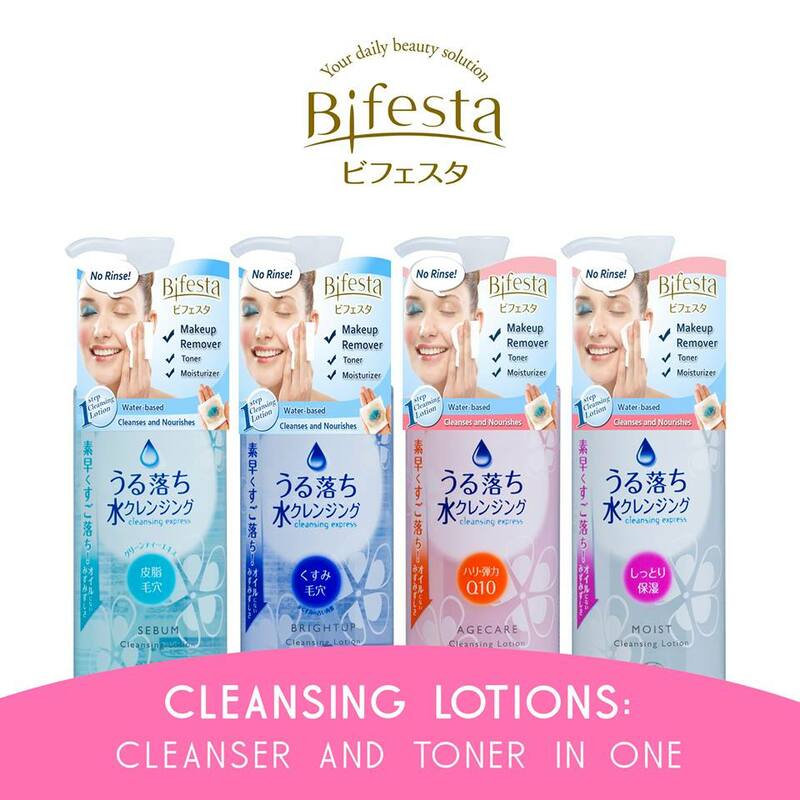 Get free samples of Bifesta, my HG makeup remover and win prizes! What are three beauty products that you hate running out of? Mine would be facial wash, SPF body moisturizer, and Bifesta. Seriously. My facial wash and moisturizer might change, but Bifesta is a permanent part of my beauty ritual. I love how it efficiently removes not only my makeup, but stains and dirt on pretty much anything I can wipe with cotton! Yes I use it to clean small brushes and smudged compacts too. That's why it's my HG makeup remover and multi-purpose cleaner. I've lost count on how many bottles I've used up already, that's how much I love it. ^_^ My favorite variant is the Moist one, but the blue Sebum version is pretty good also. Go for Moist if you have dry to combi skin and Sebum if you have oily skin. Bifesta can actually be used as a legit facial cleanser if you wear very little to no makeup. It's also super effective as a non-drying, non-alcohol toner - great for girls with skin that easily dries out. Who knew water can be so exciting? 1. Visit the Bifesta booth during these dates, in the following locations. The Lipstick Confidential Game: Guess how many I have and win...lipsticks! One of you gals asked me how I decide on what lipstick to wear whenever I go out, considering all the colors I'm lucky to have. It's pretty easy, actually - I just put on whatever I haven't reviewed and swatched yet! As a beauty blogger I'm fortunate to have access to the latest releases so I usually get packages from brands everyday. ^_^ It's fun, but also confusing sometimes. It's difficult to keep track of what I have if I don't keep them in sight always. Anyway, it's time for yet another giveaway! This is the third time I've held a contest like this, if I remember correctly. Just guess how many lipsticks I have currently and you'll get a chance to win some brand new colors. Simply follow Rafflecopter app below by Tweeting your guess and I'll choose the number closest to the actual number. If you guess the exact number then good for you. You're awesome. Get to the jump to see the mechanics and prizes! Getting an iPhone last year changed my life. I've been an Applephile ever since I can afford one, but I was just really hesitant to cough up the cash for one of the smartest phones around. What was I thinking! Because of the iPhone (on a Smart unlimited data plan), I am able to be on track with all my clients even if I'm out running errands or attending meetings and events. I can shoot product photos and swatches on the fly, and use apps to manage my finances and increase productivity. I'm never really bored. It's pretty awesome! I'm sure everyone will tell you the same thing: it's not worth getting an iPhone unless you have unlimited data in some form. Smart is my network of choice, not just because they work with me, but because the connection is reliable. Well there are rough patches but 95% of the time I am able to connect to LTE and have a clear phone call. That's much better than my last network. 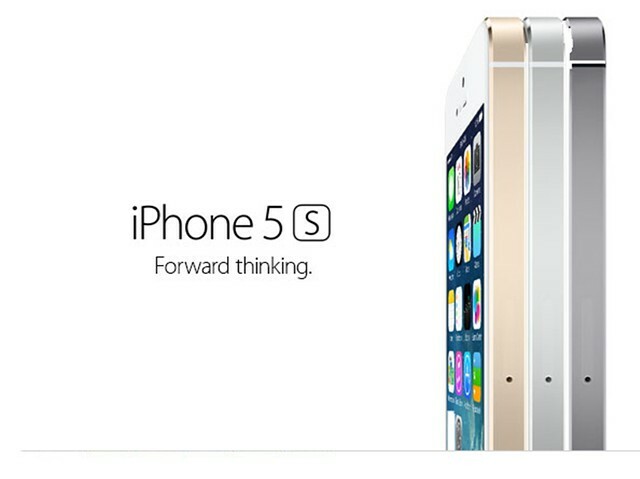 Anyway, I'm happy to announce that you can now get the iPhone 5c and 5s from Smart today. The packages are pretty attractive, so if you're looking to upgrade to a new phone and perhaps a network, too, then check out the plan matrix after the cut. 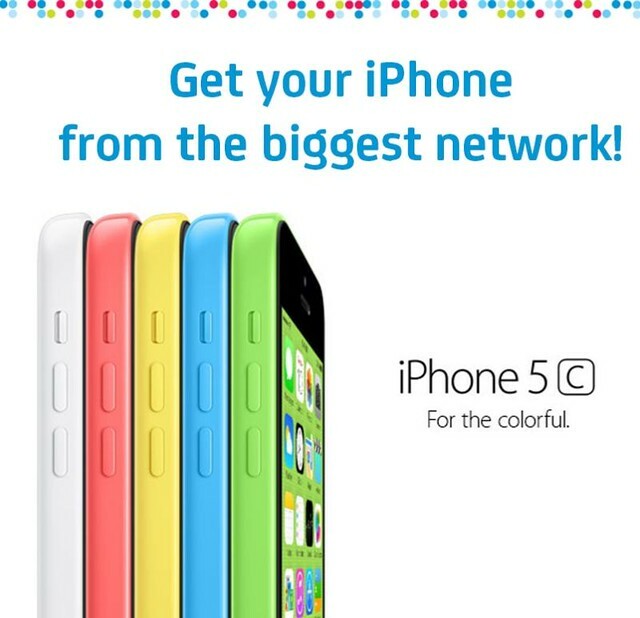 :) I think the best deal is paying the cashout fee of P6,000 for an iPhone 5c 16 gig with an P1,800 postpaid plan. Not bad! Are you feeling unhappy with your BB cream? If you think that it's time to replace it with something that'll hopefully work better, ZA Cosmetics has a great promo for you. From October 12 to 31, you can take the ZA Half Face Test, turn in your old BB Cream*, then get the ZA Total Hydration BB Cream at 50% off! It'll be P213 only after the discount! You should def do this if you have old tubes of BB Creams around. ;) Or if you just really don't like your current one. 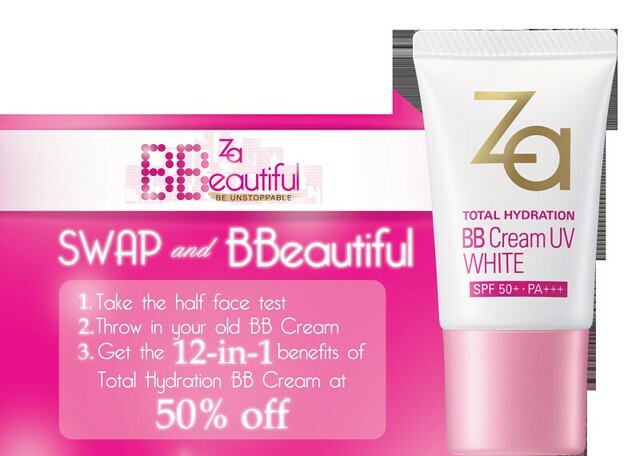 The ZA Total Hydration BB Cream is supposed to visibly make skin brighter and translucent in just 10 days. It is supposedly multi-purpose and has a whitening effect with SPF50 PA+++. So! Let's make this a little more fun. I'm giving away the Total Hydration BB Cream UV White, True White Cleansing Foam, True White Prizmizer, and True White Day Protector to FIVE lucky winners. This set is worth P1,710. ^_^ The winner (or her representative) must be able to pick up the set at Luxasia's office in The Fort. Good luck! Ibuki is my current HG skincare and I can tell you, it really helped my skin recover from the daily stresses life throws at it. It definitely makes my skin ready for anything! In that vein, Shiseido and I would love to know a little more about you - what does your day look like? Are you the kind of woman Shiseido envisioned when they created the Ibuki line? I know we are! Our lives are so busy that we aren't able to worry about how our skincare is not suiting the levels of stress we get from our environment and schedule. 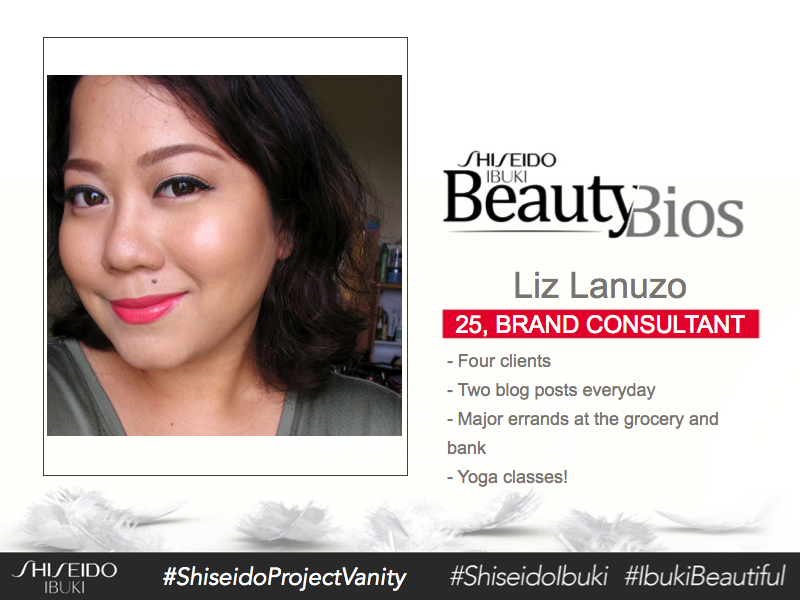 With Shiseido Ibuki, you can get skincare that works for and with your busy life. As someone who has been using this line for two months, I can attest to the fact that it can keep my skin glowing even during the most stressful days. ^_^ So yeah, it's a must try! Project Vanity x Zen Zest: Win P3,000 worth of GCs!